We are honored to be a part of each and every wedding and all special events held at our facility. We take pride in delivering great service, professionalism, timely responses to calls and email, and working with all parties and vendors alike to have everything run as smoothly as possible throughout the entire booking, planning, coordinating and day of the wedding. These kind reviews mean everything to us. Thank you so much Barbara! We still have our guests rave about your venue. It was truly the perfect day. Thank you so much! The day couldn’t have gone as perfectly as it did without you, John, and your crew. We received so many compliments on our venue and newly engaged couples who are friends of our family have been asking about the barn as well as some family! We may see you next year! We thank you for all your help in making our big day so special. I had my wedding here in July. This venue is beautiful with very helpful staff. The views are spectacular. The owners are very helpful and considerate. This venue made my wedding day very special. Thank you for all you did in helping make Brooke and Spencer’s day the fairytale day she had always dreamed of. It was everything and more than we could ever want for our daughter’s special day. The wedding and reception was absolutely beautiful!! Very well organized and the food was great!! Absolutely picture perfect place to have your wedding. Views of the mountains from the ceremony site and from inside the barn are spectacular. Owners of the barn, John and Barbara, created a fairy tale wedding day for my son and his wife. The atmosphere is shabby chic. Rustic but with beautiful lighting and features make for a beautiful venue. The wedding was non stop fun. I wholeheartedly recommend this venue. Shop and compare! We toured several barns and golf course venues. Nothing compares to the space, views, and services included for the price! The barn was everything I imagined, gave me goosebumps when I saw it all lite up for the first time! The staff is extremely helpful and very professional, they brought the “elegance” to the “rustic” all around experience! Thank you again! Very charming barn, loved loved the large deck to view miles & miles of the mountains! My photographer got some great shots in and outside, those are going to look so good in our photo album! Thank you Barbara & John for all your help! Drove by during a wedding to see exactly how it would look… just perfect! The next time I stopped in I BOOKED our August 2016 wedding! Very pleased, so excited, thank you! Thank you for providing an absolutely perfect venue for my daughter’s wedding! Everything was perfect and we were all happy with the big day! Absolutely stunning view, sunset AND saw fireworks from a neighboring town in the distance… bonus for us! The new bathrooms are great! Super to have the barn own the bar, and a nice pour on the drinks! Thank you! Thank you so much for all the hard work and planning you guys did on your end for our big day! We couldn’t have asked for anything more perfect or special, it was definitely our dream day! It truly is a Mother’s dream come true for her daughter on her Wedding Day! I can’t thank you enough. I did the math… all inclusive with the tables, chairs, linens, fabulous decorations that are included, wonderful lighting etc. all included. Yeah… the Maine Wedding Barn is the place for us! 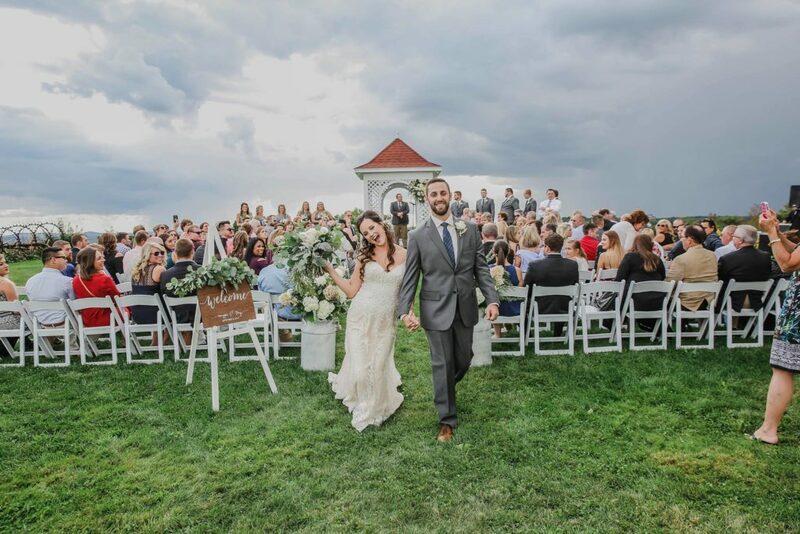 We knew we wanted a rustic venue for our special day and had been looking online at the different barns in Maine that do weddings. A lot seemed overpriced or not in a good location. We came upon the web page for The Maine Wedding Barn and thought it was beautiful and a fair price for what you get. This was the only place we visited because we fell in love with the barn! The owners are awesome and explain everything thoroughly so you understand what you are getting into for pricing and what is included. This is a venue I would highly recommend to anyone looking for a rustic barn venue. Very please to have booked our October 1, 2016 wedding here! We could not be happier and cannot thank you enough! Our wedding was the exact vision I always wanted and Barbara, you were so helpful and just phenomenal. Thank you, Thank you, Thank You! Thank you for all your help during the planning, setup and throughout the reception! You two were the best! Our wedding was flawless! It takes a great deal of communication between the bride and groom, our wedding planner and the hosting facility Day of Coordinator. Thank you for making it all come together!